Jobfeed has implemented a number of changes in the portal so you will benefit from even better results! By improving the company’s database, we can recognise more companies and connect them to information such as industry, company and address. You can now find companies more accurately based on the number of employees, industry, and when using the Jobfeed Excel export, also company address information. You can see the detailed company information in the Jobfeed portal when you click on the organisation name in a job description. To enhance usability, we have done some minor adjustments to the layout. This way you can easily retrieve the correct job data. The options to save a search or to refresh are now available through smaller buttons which you can find on the bottom left of the search form. In addition, the look and feel of the interface have been slightly modified. Are you already a user of Jobfeed? As of today you will see these changes in the portal and automatically benefit from even better results! 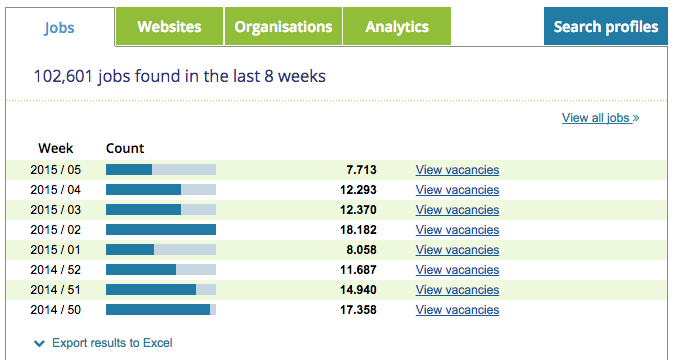 Are you not yet using Jobfeed to generate leads, gain insight into your market or find the right job for your client? For more information about the new release or a demo, contact Marcel Wijngaard, wijngaard@textkernel.nl+31 20-494 2498.